I was born in Australia in 1975 to Australian parents (who have an Italian/English heritage). Right through my childhood, primary school and high school, I had a yearning to see other places, but had never left Australian soil. From a young age, I had numerous overseas penfriends. Back then – before the concept of the internet was even considered in the public sphere – I waited eagerly each day for the postman to bring envelopes from far off exotic places. I carefully peeled off the stamps for my album, and read letters from other children living lives in places very different to mine, yet revolving around most of the same daily issues as mine – school, family, friends, food. Australia is perhaps the most multicultural country on earth and has been referred to as a “cultural melting pot” where, at least for the majority of my life and in my own experience, those from different backgrounds live relatively harmoniously together. I must check on the actual statistics, though a large part of the current population, if not born overseas themselves, have at least one parent, or most certainly a grandpart who has immigrated from foreign land. I grew up in a rural area where we were predominately white children with a european heritage, though I do remember always having a keen genuine interest in other cultures rather than any fear or predjudice. I am ashamed to say that there was little that I remember being taught in school of the traditional aboriginal ownership of my country, and history of what really happened when the English settled was glossed over. I’m pleased to see that this is changing but that’s another story. In 1991, at the end of grade 11 (my 2nd last year of high school), my mother and I went for a short holiday to Singapore to visit an uncle who was living there at the time. Funnily enough, that was the first overseas trip for both of us. One of my first real encounters of another culture was to see armed guards at the airport on arrival – in neatly pressed uniforms and carrying massive machine guns. Leaving the airport, I was overwhelmed with the sights and sounds of another land for the first time. Being almost 20 years ago now, most of my memories have merged into a few mental images, such as huge shopping centres, men recognising us as tourists from a mile off and offering “copy watch, copy watch”, a crazy bus ride on a Malaysian day trip, finding a tiny turtle in the swimming pool of my uncle’s apartment building! Becoming a travel agent after I left school meant that my thirst for other cultures was fulfilled with a number of countries being ticked of my wish list! I remained living in Australia until 2001, though began working in the backpacker industry where meeting those from other countries became a part of my everyday life and I loved it. Though it baffled most Australians, I got very good at spotting the difference between a Scottish and Irish accent, an American and Canadian one (and knew that almost every Canadian traveller had a flag displayed proudly on their backpack or clothing somewhere to assist people in doing just that!). I had lots of adventures travelling not only overseas but also within my own country, and was surprised (but secretly thrilled) to discover that being a “real Aussie” travelling the Queensland backpacker route , I was quite a novelty to the tourists! I’d love to write more about my travels someday, and certainly have a lot of photos, as photography is a passion of mine, which compliments travel quite well. In 2001, I gained an English heritage visa, as my grandfather (who I didn’t know) was born in England. I relocated to try life based in London. Due to my travels and passion for this, along with being offered a job right after I left school, I had never really persued a university education and was joking at the time that some people spent 3-4 years to get a degree…and I was going to spend 4 years in the UK to get a European passport. At the time, I had in mind living in the UK for the compulsary 4 years to apply for citizenship (on an ancestry visa with a British grandfather), but little did I know at the time I would gain European Citizenship – but it was to be Dutch! 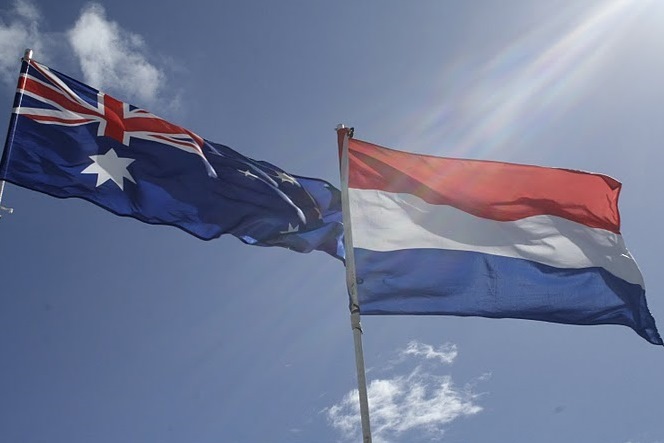 So this blog is to be a collection of my experiences and I hope to also gather stories of others in similar situations about either becoming a dual national, or having connections between the Dutch and Australian cultures. I will write predominately in English, being my native language, though I’m fairly fluent now in Dutch – I can read and speak it well, though am not very confident expressing myself in writing in het Nederlands….though perhaps I can use this blog to try and change that! I’m currently based in Brisbane but writing this on holidays in North Holland, where my husband, Bas, is sitting outside by the canal with his parents, and our daughters Sophia (3 – born in Delft) and Isabella (1- born in Brisbane) are sleeping soundly. I look forward to inviting my Dutch/Australian friends to read this blog, and meeting new people through this medium. I love quoting the title of the late Eef (Eve) ten Brummelaar booklet: “Tulips under the Gum Trees.” But, in your case it’s not Dutch in Australia but more like the reverse. I’ve been in Australia 54 years, and been particularly involved with my Dutch roots again, after I needed to retire a little early from teaching to look after my then ageing parents. Have both countries pull at the heart-strings is such a common situation, for us, in Australia, I reckon. My daughter was very pleased to have a Dutch-born Dad. She (born in Sydney. Australian mother) is currently in London but has been in the Netherlands a number of times and feels quite at home there. It used to be said, that when my parents brought me to Australia, in 1956, when I was 12, that our cohort were “the invisible Dutch”, (too) eager to “assimilate”. Thanks for setting this up. The more the better!! Thanks for taking the time to comment and share your story, a lot of the concept behind this blog is that I love to hear the experiences of others with the mutual Dutch Australian heritage. Also just got your friend request on Facebook, looking forward to getting to know you better! Next Saturday I’ll be attending the Koninginnedag “Reception” again. Was planning not to attend but, after the success we had promoting the books written by Dutch-Australians, at the Holland Festival, in St Marys, the ‘board’ (DACC Committee) agreed that it would be good to repeat that, at the Dutch Queens Birthday “Reception”. I’ll be happy to sing (het) “Wilhelmus” as well as Advance Australia Fair. It won’t have the same fervour as it used to have at the Koninginnedag Balls, in the 60s to 80s. It was God Save the Queen and Wilhelmus when my parents and I first started to attend these dances. Again, it’s just a fact that 12 of my life’s years (the formative ones) were spent in Gouda. The other 55, in Sydney (or at least NSW). Happy to speak Dutch, where and when it’s appropriate (e.g., to the men who were my school mates, in high school) and many other Dutch-born people. Happy to use English when appropriate. See good and bad in both stereo-types of the nationalities. I do like stirring the pot a bit about campaigning against the notion of “the invisible Dutch” but that’s just to restore the balance. And comes back to where I started this: It’s just silly to deny that I’m Gouda-born. I would not like to live there any more. Hope to revisit it before I get too old, for a 6th or even 7th time!